With more and more of us enjoying music or podcasts on the move, the demand for headphones that offer exceptional audio quality and comfort has never been greater. The latest headphones from leading brands like Samsung reflect this demand by delivering ever more sophisticated audio performance in increasingly svelte designs. Whether you're looking for sports headphones that will stand up to the rigours of an active lifestyle or immersive over-ear headphones that will bring your favourite music to life, our collection - including the latest Samsung headphones - has something for you. In the race to develop increasingly innovative headphones, Samsung have come up trumps with their ingenious IconX Wireless Bluetooth headphones. These sophisticated Samsung headphones combine an array of smart features to offer a wireless audio solution that's flexible enough to accompany you wherever you go and however active you are. The cable free design means you can get active without worrying about trailing wires, while the clever in-ear design guarantees a snug, comfortable fit. These headphones will stay firmly in place however intense your training gets. The IconX takes this fitness-focussed functionality to the next level by incorporating an integrated fitness tracker, meaning you won't need a smartphone to track your activity. 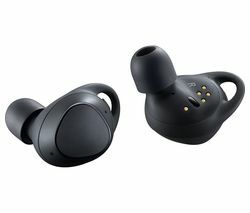 These innovative headphones will monitor your walking or running activity with your speed, distance and duration as well as heart rate and calories burned. Throw in an Ambient Sound mode that lets you hear what's going on around you to prevent accidents, 4 GB of internal memory that allows you to store up to 1000 songs and an accompanying charger case that ensures powering your headphones up is quick and simple, and it's clear that Samsung have delivered the ultimate no fuss, fitness-focused headphones. Our complete range of wireless headphones features the latest models from all the leading brands. Check out the latest Sony, Bose and Beats headphones and discover a world of wireless audio.